Meet your experienced local guide inside the iconic Union Station in the heart of downtown Denver. 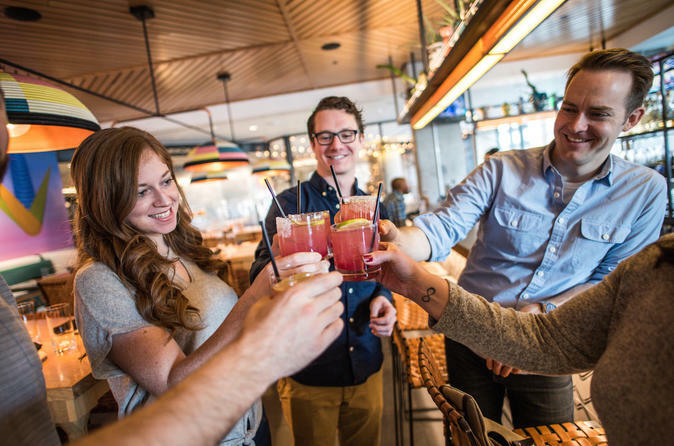 You'll learn about the city's thriving food and cocktails scene and hear what you can expect from your cocktails tour. Head out on foot to your first of four delicious stops. At each of the four restaurants, you'll taste a craft cocktail and learn about what makes each location unique. Cocktails will be paired with food bites at each restaurant. In total, you'll taste 5 interesting and unique cocktails over the course of the tour and enjoy four appetizers along the way. Your tour will continue into the Oxford Hotel, Denver's oldest hotel full of unique and interesting history. You'll walk on to one of the oldest operating restaurants in downtown Denver and finish with a delicious cocktail and bite inside the Maven Hotel on the Dairy Block, one of the hippest new micro-districts in Denver. You'll leave feeling pleasantly buzzed from your 5 cocktail tastes, and food pairings are equivalent to heavy appetizers. Most guests continue on to dinner after the tour.